finally not one but 4 different types of tomato grown in the Pachino district in south-eastern Sicily: the Pachino ciliegino (“cherry”), the Pachino costoluto, the Pachino a grappolo (“bunch-of-grapes”) and the Pachino tondo liscio (“round and smooth”), all of which have absolutely incredible flavours. No surprises for guessing that tomatoes are used in Italy for salads and for preparing tomato sauces for use with pasta and pizza. But there are other uses, too: they can be stuffed with rice and baked or used to braise thin steaks in, to name but two. There are still plenty of Italians today who grow their own tomatoes and conserve them (usually in bottles) for use throughout the year – I remember passing several August bank holidays on a precarious hillside in Calabria, getting my fingertips scalded trying to clumsily peel freshly-boiled San Marzanos and chucking them into the mincer for bottling in a mass, family operation involving about 10 people, most of whom were sprightly octogenarians and who had done all the hard work of sowing and tending the tomato plants over the previous months. This all produces wonderful results, but I can’t really expect you to go through the whole process, can I, particularly when I don’t bother to do it myself… You can quite happily use the canned and bottled varieties, though I will be including a few easy recipes which require fresh tomatoes. One thing I would ask of you is to try to avoid buying fresh tomatoes completely out of season. The tomato season is roughly from June to October (earlier in southern Europe, later in northern and for late-ripening southern varieties). Fresh tomatoes in January in Ireland will probably have come from Chile or some other place in the Southern Hemisphere, so think of the environmental impact of bringing them all the way to your local greengrocer or supermarket. Italy is lucky as the south of the country can usually produce tomatoes all year round, with the use of greenhouses – less flavoursome, but perfectly acceptable. Whole tomatoes (better if the can says San Marzano), usually peeled (pelati, in Italian). 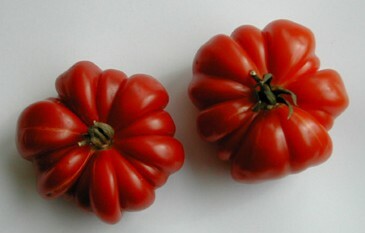 Sometimes described as plum tomatoes. Diced tomatoes, sometimes known as “crushed” or “chopped”. Cherry tomatoes. Only use these if you need cherry tomatoes and can’t find fresh ones. Diced or simply “sauce” with added herbs (often basil or oregano). Avoid these like the plague. Stick to the simple stuff above. In bottles you’ll find the stuff that probably a majority of my tomato-based past recipes call for – passata, or sieved tomato. This is simply what it says – peeled, sieved tomatoes. Both this and the first two of the canned variety should only contain tomatoes and salt in the list of ingredients. If there’sanything else, then forget it. Tomatoes are acidic enough not to need conservaties of any sort. There are probably a million different types of pasta knocking around, human beings being as creative as they are. Oriental cuisine knows a good number of them (and indeed are credited with inventing pasta – or noodles – in the first place), but I’ll be dealing exclusively in Italian pasta. Pasta, or pastasciutta to give it its full title, literally means “dry dough”. Not very appetizing, I agree, but then neither is pasta on its own – and that’s where the sauces come in. So, while there may be around 20 popular commercial types of pasta available in the supermarkets (and many more if you count home-made past), there are literally countless ways of dressing the pasta (I say, put your knickers on there! ), so the potential for this site is about 2,357,882 recipes. That should keep me occupied for the rest of my existence…. Those of you who feel the need to do so can look up Pasta on Wikipedia where you’ll find a very detailed article with lots of information on the history, uses, production and even regulations regarding pasta (including a particularly nauseating list of US varieties – though I would call them deviants – of pasta). For everyone else, pasta is simply a mixture of durum wheat flour and water, formed into a dough, cut into whatever shapes pleases you and cooked, usually by boiling for anything between 2-12 minutes depending on the format and size. 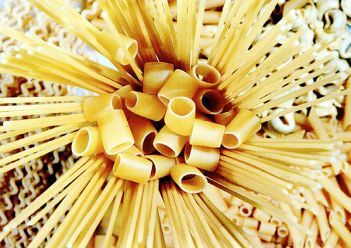 Fresh pasta – which you can often obtain outside Italy at specialist stores and even in some supermarkets – is, obviously, fresh and pliable and can be made with regular wheat, not durum. You may also find egg pasta, which uses eggs instead of water and, again, either durum or soft wheat. Fresh pasta is, I’m reliably informed, incredibly easy to make, though you need a large kitchen table to roll the dough with and a pasta machine to cut it for you, though a special hand-held pasta cutter will also do the trick. I have none of these things in my kitchen (mostly due to lack of space), but I will give you a friend’s recipe for this later. In the meantime, you can quite happily continue to use the dry pastasciutta (that’s pronounced “pas-tah-SHOE-ta”), which most of the recipes here will call for anyway. I mean, why complicate your life even further? What I don’t want to see you doing, is either using little jars of pre-prepared sauces or – horror of horrors – something that is all the rage here, at least, and that is nasty heat-and-eat bags of frozen pasta complete with dressing! Any of you caught doing that will be horsewhipped until the sun shines for one whole year in Ireland! Only put pasta into boiling salted water. Don’t forget your pasta after you’ve put it into the pot. Think of it as a small child* – incapable of looking after itself. It needs a stir every now and then to make sure it doesn’t stick together (which it has a nasty habit of doing). Make sure the water doesn’t go off the boil (it will immediately after you put in the pasta, but that’s ok). And you don’t need to keep it boiling like mad either, which only wastes energy – just keep it bubbling over. Don’t trust the time indicated on the packet: it is a guarantee for mushy, slimy pasta, the sort you eat in dodgy, touristy eateries round the corner from the main train station of most European capital cities. Not good. You get the idea. So, take it out 1 minute before the indicated time. For advanced users… instead of timing it, you need to taste it to know when it’s ready. You’ll get to know the point between still-hard pasta and too-soft pasta (technically known as the al dente point, meaning just ever the slightest bite in the pasta, but nothing actually hard), but that point disappears in the time it takes to shoo the cat out of your vegetable rack. And another thing, you don’t need to rinse drained pasta in cold water. You’ve just drained it for feck’s sake… what do you want to go wetting it for again? Rinsing pasta is useful for stopping the cooking process (pasta is like a frog, it continues to live even when it’s out of the water), but you only need to dash a bit of cold water through the colander. Finally, if you find you’ve cooked too much pasta, don’t chuck it in the bin – put it in the fridge covered with cling film and it will be perfectly good tomorrow or the day after. I’ll be including some “leftover” dishes along the way.